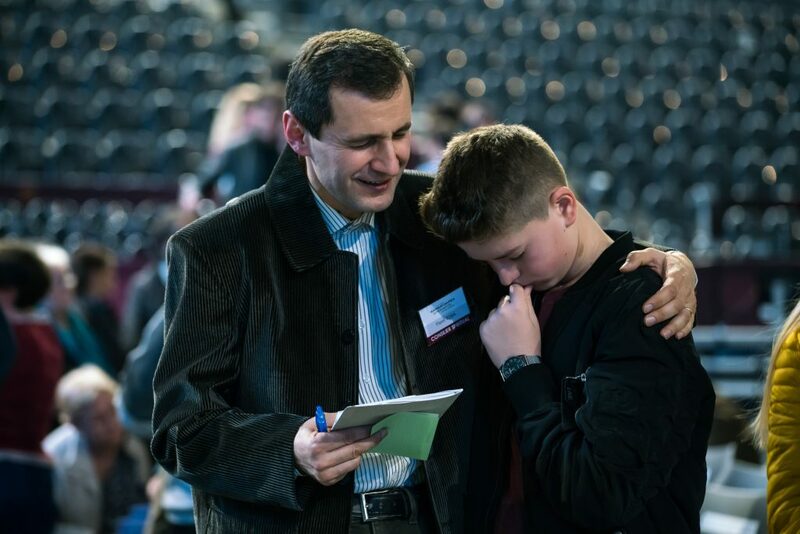 A counselor at a recent Will Graham Celebration in Romania prays with a young man who wanted to know more about Jesus. The man behind the wheel was an alcoholic. His marriage was broken. He was angry and bitter, and he didn’t mind one bit showing his disdain to the people who climbed into his vehicle. The year was 1959, and Ron Baker was one of many Australian bus drivers who had been hired to transport people to and from my grandfather’s Crusade at the Sydney Showground. Night after night he put up with his riders singing hymns and worshiping. He’d drop them and sit in his seat stewing until the doors opened and his bus filled again with jovial people who were excited about what God was doing in their city. Mr. Baker’s wife attended the Crusade and she committed her life to Christ. The following week, Mr. Baker found himself in the same stadium to which he had begrudgingly brought others. When the invitation was given, Mr. Baker walked forward. God radically transformed Mr. Baker’s life following his salvation. He gave up those things that were poisoning his body, mind and marriage. He pursued theological education and became ordained. As I contemplate the story of Ron Baker, I’m left with three thoughts. There are a lot of Ron Bakers out there. We pass by them every day; people who are hurting and broken, and probably know it. Their addictions control them, their marriages are fractured, and their hearts are far from God. In Mr. Baker’s case, he flat-out hated Christians, yet deep down he was searching for hope. Once he found it, it changed his life and eternity. As I approach an evangelistic outreach, I often pray that God would raise up “the next Billy Graham” from the people who respond at the invitation. I pray for the person that would reach the world with the Gospel. Mr. Baker, however, is proof that even if a person doesn’t reach millions, they can and do influence others, passionately sharing the Gospel to those around them. Evangelism is vertical. Mr. Baker and his wife made individual decisions for Christ, reconciled their marriage, and began living for Him. Their children were then raised in a Christian home and went into ministry. Mr. Baker’s grandchildren were raised by godly parents and began relationships with Jesus. Entire generations can be impacted when people turn to Christ. It’s easy to think that a heart is too callous to be pierced by the Holy Spirit. We may believe that our neighbor, our co-worker, or the bus driver for that matter, could never find hope in Christ or be used by God to reach others. The story of Ron Baker, however, shows that God can reach and use anybody. We just have to do our part in sharing the Good News with them. Where do you start when sharing your faith? Read Sharing Your Faith 101.